Inspired by one of the most terrifying, cult movie franchises ever released in theaters, named one of "The 25 best horror movies since 2000" (AV Squad), one of "The 100 Best Horror films" (Time Out), and one of "The 25 Best Horror Movies Since The Shining" (Vulture), the six-part television event, WOLF CREEK, is a psychological thriller premiering exclusively on Pop on Friday, October 14 at 10:00 PM, ET/PT. "WOLF CREEK is holy !#@$! scary!" said Greg McLean, Executive Producer of the WOLF CREEK television series and the writer, director and producer of the WOLF CREEK movies. "The television series delivers the same pulse-pounding tension and terror of the films combined with a storyline that evolves into a suspense filled, character driven psychological thriller. 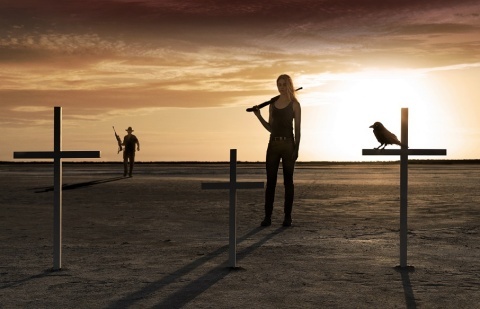 In many ways, WOLF CREEK is more like a Western—set in the untamed, desolate landscape of the Australian Outback, with gritty characters and an immersive story of revenge and good versus evil." "WOLF CREEK is a binge-worthy, premium revenge tale that we are thrilled to bring fans at the perfect time of the year," said Brad Schwartz, President, Pop. "To turn everything you expect from a horror film around and hunt the psychopath through a strong and singularly-focused female protagonist is thrilling to watch. It is probably the scariest series to ever premiere on basic cable and will have viewers hooked 13:40 minutes into the first episode." John Jarratt is a television and film actor, producer and director from Australia. Jarratt is best known for his chilling performance as the iconic character Mick Taylor in the feature films "Wolf Creek" and "Wolf Creek 2." His previous credits also include Peter Weir's "Picnic At Hanging Rock," Baz Luhrmann's "Australia" and Quentin Tarantino's "Django Unchained." Lucy Fry is a film and television actress. Most recently, Fry starred opposite James Franco in the Warner Bros. for Hulu mini-series "11.22.63." She is also known for her roles in director Joseph Castelo's indie film "The Preppie Connection," the Cinelou Films feature "Mr. Church," the Universal feature "The Darkness," and Mark Waters' fantasy feature "Vampire Academy." Fans don't sit at the outskirts of pop culture making snarky comments. They live right smack in the middle of it, sharing, creating, and connecting their passions with others. At Pop, fans finally have a destination that celebrates the fun of being a fan. Fans aren't even fans anymore — they're gladiators, tributes, human beings and blockheads. Seen in more than 80 million homes, Pop gives fans a dedicated channel that loves being a fan as much as they do. A channel that respects talent over celebrity. A channel filled with optimism, passion, humor, and excitement. A channel that understands the fun doesn't stop when the credits roll…it's really just the beginning. Zodiak Rights is the international distribution division of Banijay Group, a leading creator and producer of TV content worldwide. Zodiak Rights represents quality, excellence and experience in the business of television and ancillary sales across all platforms. It is one of the world's biggest independent distributors, with a catalogue of more than 20,000 hours of globally best-selling content across all genres including drama, formats, factual, entertainment, theatrical. 50% of the catalogue is third party programming from independent producers and networks throughout the world. Zodiak Rights' scripted programming includes big-budget Canal+ flagship drama Versailles sold in more than 135 territories; Screentime's Wolf Creek , based on the international hit feature films; original Belgian French-language drama Public Enemy , winner of the inaugural MIPDrama Screenings; The Returned , an International Emmy Award winner, trilingual political suspense thriller Occupied ; Wallander , the BAFTA award-winning drama series for BBC One starring Kenneth Branagh; Braquo , the top-rating French drama; and critically acclaimed Irish serial drama Rebellion. Zodiak Rights' theatrical portfolio includes: Millennium: The Trilogy ( The Girl With The Dragon Tattoo, The Girl Who Played With Fire, The Girl Who Kicked The Hornet's Nest ), and UK box office smash The Inbetweeners 1 & 2.